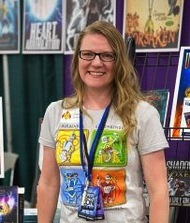 Candace Thomas is the author of the Vivatera fantasy series, Vivatera and Conjectrix. She contributed to Moments in Millennia. Vivatera won the Diamond Award for 2013 Novel of the Year by the League of Utah Writers. She studied creative writing and theatre at the University of Utah. She and her husband and two daughters live in Utah. She is a member of The Church of Jesus Christ of Latter-day Saints. This page was last edited on 5 June 2016, at 22:34.